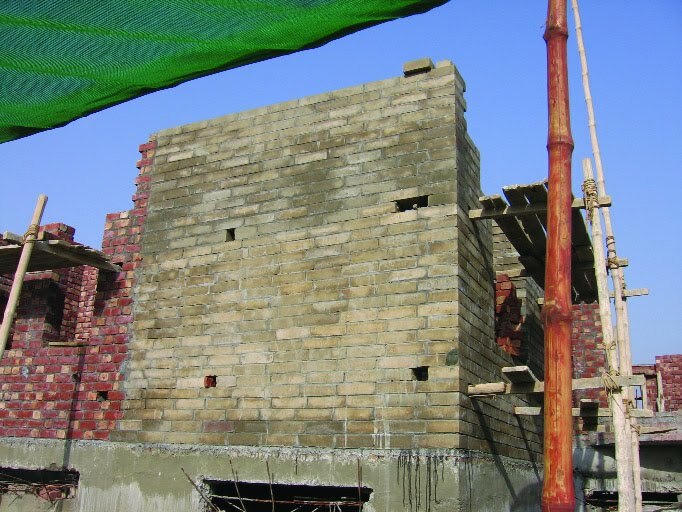 In October, 2007 we considered building our house in Lahore where we had moved a couple of months earlier and it appeared that we were going to stay put for the foreseeable future. I had always admired houses made of soil in its most natural form. Rammed earth, Wattle and daub, Adobe, Cob and CSEB seemed to me to belong to their surroundings as fired brick didn't. 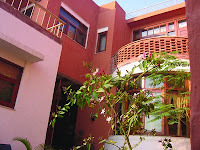 Urban and climatic constraints however rule many of these techniques out, except Rammed earth and CSEB. Having worked with CSEB many years earlier in my days with the Aga Khan Network, I decided to give this medium a try once again. CSEB are compacted soil blocks produced in a specially designed manual press. The press is known as Cinva Ram and was first used in South America about 60 years ago. The basic component of these blocks is soil to which some amount of sand is added for its inert qualities. Depending on the overall soil composition and the type and amount of clay particles in it, it is stabilized with cement and/or lime to a ratio of 5-10% by volume. The dry mix is gently sprinkled with a little water and mixed with a fork. The water should be just enough to make a lump as you squeeze it in your hand. 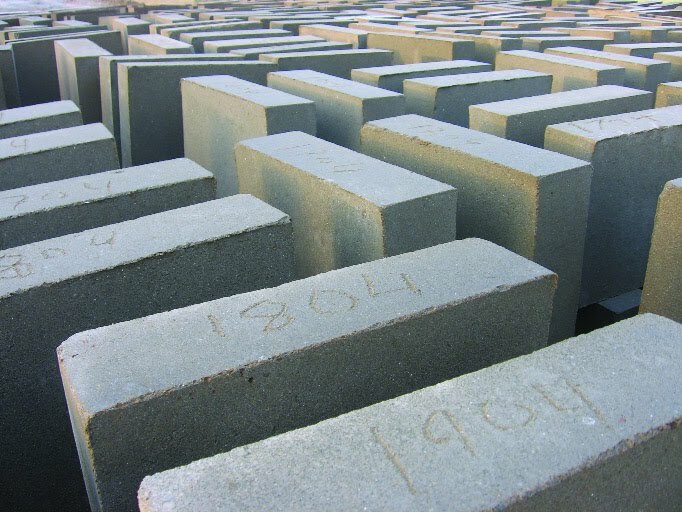 The process of compaction and stabilization together ensures that the block gains sufficient strength after proper curing and makes it equivalent to a kiln produced brick. One could see endless examples of this medium from places in southwestern US like New Mexico etc. 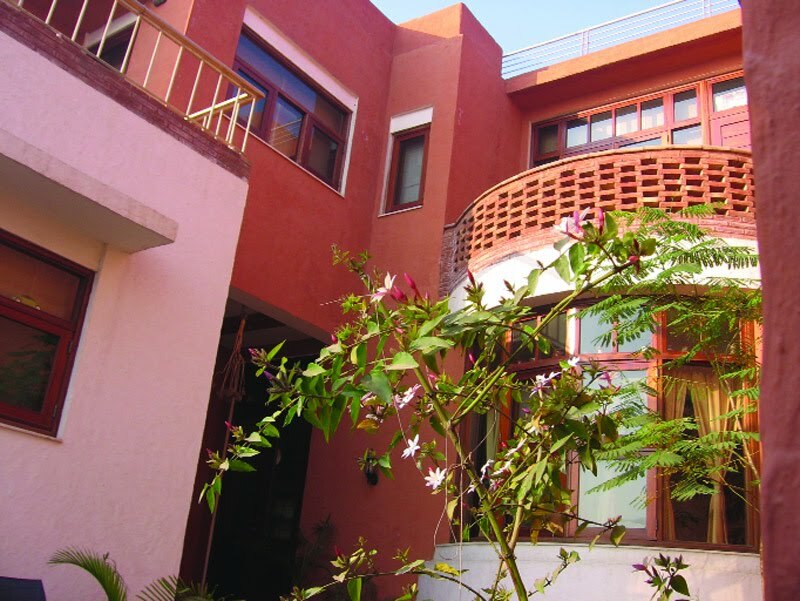 Closer to home in India too, with the Auroville Institute in the state of Tami Nadu, India, taking the technique various notches up. Contemporary examples in our immediate urban environment however, are hard to come by. My brief search for the same in Lahore was predictably unsuccessful, but I decided to go ahead nonetheless. Some research later, which included the tests of soil samples from the site ( X-Ray Diffrected and Petrographic Modal analysis) at the New Campus Geology deptt, the hunt for a source of hydrated lime, locating the fellow in Karachi who had made the Block Press for us earlier, discussions with Auroville regarding the best block size for a small project and overall composition based on the type of soil I had available, and finally after consultation with the engineers, we designed a load bearing house in CSEB. Our Block size was going to be 12"x9"x3.5" and the composition was to be 1:3:6, where soil was 6, ordinary sand (not the more expensive sharp sand) was 3 and cement and lime was 1 (half and half). Now started the tough part, finding and retaining a team who would make the blocks and a contractor who would be willing to re-train his labour to build with a material they were unfamiliar with. There were countless questions but I was lucky to find a group who were willing to take chances and get the answers as we went along. A nasty surprise was in store early on though. The speed with which we had anticipated to work was too ambitious. Along with the press we had made a huge pulverizer to break down big lumps of clay but it never worked. We had no choice but to manually sieve all the soil we wanted, the day before we would want to produce, and the production of blocks did not exceed 120 blocks a day. By a rough estimate I would need at least 50000 blocks (CSEB being equal to about 3 bricks). That would take me at least a year of non-stop production. I had limited time but didn't want to give up what I had learnt so far. So I compromised and settled for a single room with three exposed walls made with these blocks, some accent walls in the house and the entire boundary wall. We made about 5000 blocks in all. Wasted some, randomly tested some and built with the rest. For trial only we added kairi and even chopped jute to some blocks, with excellent results. But in the interest of time and an ease of execution, stuck to the initial mix for the most part. The test results in the beginning at 14-28 days of curing would not exceed 550- 600 psi. The addition of hydrated lime in the mix held the promise of an increase in strength as the months passed. Sure enough when we tested the block (at PITAC) many months later it had gone up to an average of 1100 psi. CSEB is completely sun and air dried, unlike the brick industry which guzzles endless amounts of fuel and adds to environmental pollution. It uses up all the soil that you dig up for the basement, much of which would be wasted in a conventional house. Essentially then, the basic material is free of cost and right under your feet! It is socially far more responsible than bricks as almost all the cost associated with the production (except for the initial one time capital investment and the nominal amounts of cement and lime) is handed to the labour. With my inefficient press and low production rate I was still spending less than I would have on bricks. To briefly compare the cost to that of a brick; a day's production yielded 120 blocks ( a better press can yield upto 400) , cost me Rs 1000 in labour and about 500 in material, including cement, lime and sand. Each block therefore was Rs 12.5. Equating it to the cost of brick 12.5/3= Rs 4.1. A good brick at that time was between Rs 4.5 to Rs 5. This ensures a modest saving of at least Rs 75,000 in the cost of bricks only for a medium sized house of covered area between 5000 to 6000 sft. The more substantial saving follows however when laying the blocks and, during plaster. 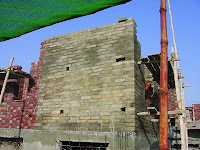 Its bigger size has fewer joints and hence uses less mortar. Plaster work is easier and more even on both sides of the wall as the neat and crisp edges ensure there is no wrong side of the wall. Provided there is a bit of space, to build and store close to the site, the transport cost associated with carting bricks to the site is eliminated. The highly compacted CSEB is thermally more efficient than brick, effecting temperature transfer at a much slower rate. Rate of water absorption of CSEB also being less than that of brick, an unplastered CSEB wall lets rain water run off without getting soaked itself. The addition of lime in the blocks (and in all mortar and plaster work, sub floors etc.) provides a healthier indoor environment as lime continuously absorbs CO2 from the air to change Ca(OH)2 back to limestone (CaCO3). With a bit more R & D, a more efficient press than the one I had used could be developed, the cement and lime mix that I used could be completely substituted with lime. Lime being much cheaper than cement and having qualities which make it superior to cement on many counts. For instance it gains strength over time (owing to an inherent process called the lime cycle), self heals hairline cracks, repels insects due to its alkalinity , and has an embodied energy (the energy employed in its production) which is much less than that of cement.